The spa was in need of cleaning. A great place to stay if you are looking for easy access to international drive. Close to Universal and other I-drive attractions. Great beds, nice background music in the room. Difficult to connect to the internet without paying an extra fee. Enter the Doubletree Castle Orlando Hotel and youll feel instantly transplanted to a time of yore, complete with dancing water fountains, magnificent art and Renaissance music. The kids will especially love the massive pool, the Playstation equipped rooms and the freshly baked chocolate chip cookies upon registration. 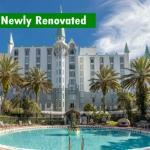 The Castle is located on the super popular International Drive with easy access to the Orlando Convention Center, restaurants and shopping and all major theme parks. Enjoy the many fine restaurants or sip a tropical cocktail at Jester's Poolside lounge. Book one of the Doubletree Castles 216 spacious rooms and you may never leave. Each room is equipped with a 6 speaker sound system, pillow-top mattresses and ultra cool air conditioning. The Doubletree Castle Orlando Hotel's junior suites are perfect for families featuring extra amenities such as a microwave, executive desk, a Queen sleeper sofa and wet bar. Here on business? Keep in touch with the home office from rooms equipped with three telephones with voice mail, data ports and High Speed Internet Access. Call up room service between 11:30 a.m. to 10:00 p.m. and get great food from Café Tu Tu Tango, one of Orlandos favorite dining destinations, delivered to your room. The Doubletree Castle Orlando Hotel is a magical destination in a magical city. Convenient to Disney, Universal and the Convention Center, the Castle has enough amenities to make leaving your room difficult. Featuring amazing restaurants, a lovely pool and a full service fitness center, the Castle is built to please. Kids will love the Castle and that makes the whole journey that much easier.